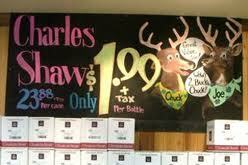 Two-Buck Chuck, in fact, costs 3 bucks. So on Sunday, the hubs and I went to Trader Joe’s for the first time. Yes, yes, people. I know the Kansas City stores have been open for more than a year. But in our defense, we were waiting until the crowds died down. And truthfully, I forgot about Trader Joe’s until our recent family vacation in California, where the store is downright ubiquitous. Then I remembered. On Sunday, we decided the state fair was too far to go, but a visit to the mecca that is Trader Joe’s would fulfill our need to browse. Apparently, Trader Joe’s is like crack for some people. Before it landed in Kansas City, folks were frequently driving four hours to St. Louis to stock up on all sorts of goodies, like the cheap wine and ginger cookies. I’m assuming the dyed-in-the-wool Trader Joe-types were not shopping at the Ward Parkway store on Sunday. The earnest-looking organic-seeking bourgeoisie the hubs and I saw shopping there were newer converts, I’m sure of it. You could tell just by looking at them, kind of the way you can smell the difference between the nouveau riche and old money. I mean, these folks looked like they were trying a little too hard to be laid back. The dudes weren’t much better, but they looked mostly like they were accompanying their North Face wives and girlfriends. Yes, I was feeling a little bit unnerved and like I just wasn’t a part of this club and never would be – a not-uncommon feeling for yours truly. Matt, however, was oblivious, oohing and ahhing over the salmon selection and the truly staggering wine department. Then we turned our cart up the peanut butter aisle. I was trying to keep to the edges, getting my bearings and steering clear of the regulars, who seemed to know where everything is. But I leaned in to look at the Nutella facsimile, to see if it were any cheaper than the one I can pick up at World Market. Just then, a Merrell-shoe-wearing Baby Boomer with chic white hair tooled her cart toward me. She stared back, then said, “You won’t be if you keep moving.” And she kept moving, so I pushed my cart out of the way. I didn’t say anything, just kept moving down the aisle. I mean, I’m not a member of this club. I kept going, turning into the next aisle. People shoved me aside to get to their favorite frozen organic black-bean-and-lentil soup with roasted red peppers. I stopped to let them, then trudged along, finding a bag of frozen berries I could use. So I had heard that the Trader Joe’s employees were uber-friendly, but I didn’t particularly witness that. In fact, the women working back by the coffee looked like they were waiting to have root canals. Excited they weren’t. Then again, maybe they were tired of dealing with the stuck-up clientele who seemed to think that just because they eat organic, their you-know-what doesn’t stink. But all that aside, the hubs and I managed to spend a fair amount on Two-Buck Chuck, ahi tuna steaks and kale, among other necessities. I’m sure the store might be a different place on a weekday, when those who want to see and be seen are busy working or sleeping or what have you. I longed to see someone who looked like they’d just rolled out of bed at 3 p.m. on a Sunday, threw on some Chiefs PJ pants and flip flops, cursorily combed their hair, swigged some mouthwash and made a run for some snickerdoodles. But alas, Dorothy. I wasn’t in Independence anymore. Oh, well, T.J.s. We’ll be back, no doubt. For the wine, if nothing else. And we will be wearing Merrells. Ahhh Kate, next time call me. I’m always shopping at stores I’m not cool enough to shop in. And I’m really good at it. And I love Trader Joe’s. OK, maybe it wasn’t THAT dramatic, but I was seriously bummed. I could have cared less that I was leaving In-N-Out Burger behind (also not one in the entire state of TX) and CA transplants, and those who had their first bite while vacationing in CA were all bemoaning THAT fact. But, in less than a year, the first, (and I hope many to follow) Trader Joe’s will open up in downtown Austin a mere 1/2 mile away from the flagship store of Whole Foods. Even though the TJ’s will be a 30 minute drive from my house, I will be there to shop. Probably not the first day (the crowds will be crazy) but soon thereafter. And if you do go in the middle of the week, it will be filled with moms in yoga pants and crying babies or misbehaving toddlers who will not keep the cart moving, but will stop in every fricking aisle to have a chat with every other SAHM shopping for good deals. Sorry to hear your first trip to TJ’s didn’t give you a better impression. We have one in Leawood that I shop at that is about a mile from the Whole Foods in OP. Unfortunately we can’t get the wine I keep hearing about, since in KS you can’t buy wine in a grocery store. I never gave it much thought buy you got me thinking about the people. They aren’t really snobs but you do get the feeling you can’t stop in one place to long to look. One thing that bother me. The food isn’t necessarily a better quality. They do have more organic, (cheaper than Whole Foods), than regular grocery stores, but they also have a lot of sugar filled treats. To many tempting cookies and candy. I have to just completely overlook all of that since I am not suppose to eat any sugar. Just because their products have the TJ’s lable doesn’t mean they are really better. I did hear that TJ’s and ALDI’s are owned by the same company. If that is true,don’t you think we’ll see the Johnson Countians cruising along 23rd street soon? Yes, it’s true. They are owned by the same company. That’s something I should have written — those snooty TJ shoppers wouldn’t be caught dead in Aldi’s, I’m betting! Yes I like going to the Ward Parkway store and invading the space of those who think they are better than me and doing what I can to upset their snobbery notions. Then I as well go to plain ole Aldi and in there nobody but the cashier who collects my money cares I am there. Cheap wine and even cheaper olive oil and some salsas are my main reason for going there to TJ’s. Some other things maybe once in a while but Aldi is the ones who get the most money form me. I mean hey when produce that is as good as most chain stores has at almost 50% off why not buy it there. And as well I like some of the German items they have off and on like Paprika Chips. So yes both store have something for all of us and the ones with their noses in the air can just learn to share space with me. You sound like you’ve struck a nice balance!